Chicago Tribune’s Paul Sullivan mentions in his piece from yesterday’s paper that most people believe Derrek Lee will be playing elsewhere in 2011. When we last checked Kornheiser's crystal ball on May 25th, we saw the names of Adam Dunn, Adrian Gonzalez, Carlos Pena, Jorge Cantu, Paul Konerko, and homegrown minor leaguer, Josh Vitters. If Sullivan is right, and the Cubs will look only at lefties, that eliminates Cantu, Konerko, and Vitters – who should be eliminated anyway for struggling mightily in double-A this year. Who are the real possibilities? Adrian Gonzalez is a trade target, but with the Padres having a great season, they will likely look to surround him with more talent next year, as opposed to moving him. 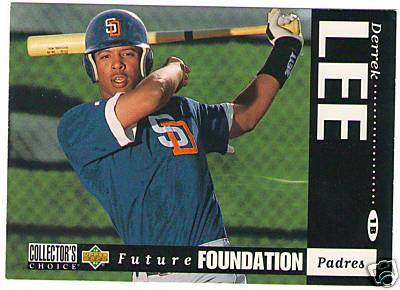 The Cubs don’t have the prospects to get him and still give San Diego a chance to compete in 2011. The Red Sox, Rangers, and a few other teams might be able to make something happen, but most likely not the Cubs. Looking at the 2011 free agent list from mlbtraderumors shows the only available lefty or switch first basemen who I think Cubs management would be comfortable replacing Derrek Lee are Adam Dunn, Carlos Pena, and maybe Lance Berkman. As a Cubs’ fan, I think it would be inspiring to see them sign Victor Martinez. Who else is out there? Please don't say Hank Blalock or Russell Branyan. (Please.) Are there other trade possibilities? Micah Hoffpauir is free so we don't have to waste money on someone who stinks. Hey Reggie, Micah Hoffpauir stinks too.